The Career Development Office at Christendom College provides career counseling and orientation for students about potential career choices; provides information on deadlines for GRE and LSAT examinations, graduate fellowships, etc. ; and assists students with résumé writing, mock job interviews, and graduate and law school applications. The office also maintains a listing of job opportunities for seniors and Christendom College graduates and acts as a clearinghouse for graduate job seekers and employment opportunities, including lay apostolates. Students are strongly encouraged to begin career planning no later than their sophomore year, so that they have time to learn more about themselves and about the opportunities available to them. Liberal Arts graduates are in great demand because they possess the high moral values, communication skills, and habits of problem solving and “high level thinking” sorely lacking in graduates of so many of the modern universities. A Liberal Arts education is an excellent preparation for the professions, and Christendom counselors can guide students so that they can complete programs in nursing, engineering, accounting, and the like quickly and efficiently, should they be called to those fields. Located in the Pope John Paul the Great Student Center, the Career Development Office maintains close contact with alumni and helps current students to network with alumni who are in professions of interest. Some Christendom graduates will continue the quest for wisdom they have begun at Christendom by enrolling in a masters or doctoral program. Christendom’s undergraduate program, in which students learn and practice analytical, critical, and communication skills in the illuminating light of reason animated by faith, is an excellent preparation for the rigors of graduate work. Generally, the student chooses as a major that discipline in which he plans to pursue an advanced degree. The selection of a graduate school and discrete program often will depend upon the quality of professors at a given school and whether the student desires an academic career (which usually requires a Ph.D.) or one in any of several other professions, including teaching and lay apostolates. Past graduates of the College have earned master degrees or doctorates in theology, philosophy, English, government, history, and classics. To support and encourage those students disposed to advanced study, the College’s Career Development Office disseminates information about the GRE, graduate schools, and educational funding, and offers aid in the application process. Christendom’s faculty members also advise students regarding graduate school and help them with some application preparations. 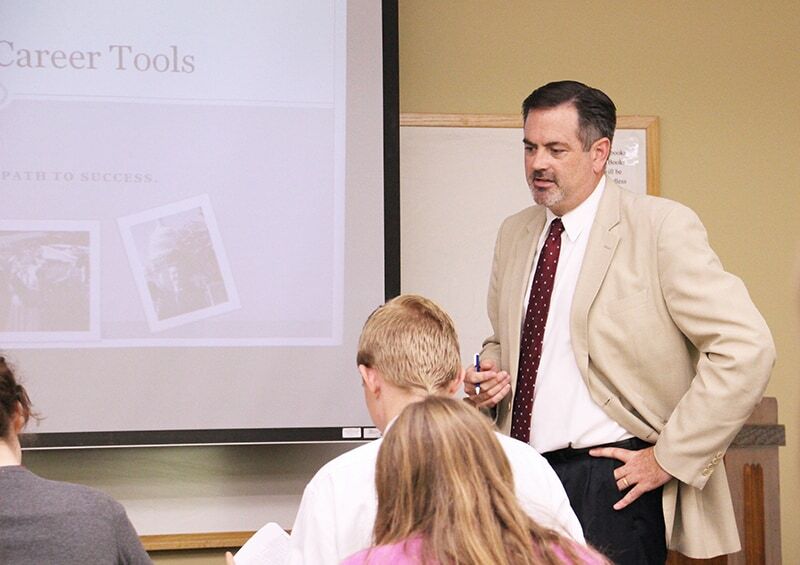 Students naturally seek to know how Christendom College’s curriculum can help to prepare them for a career. It should be clear from its emphasis on truth and academic quality that the College is in no sense a vocational school; it provides an education whose primary ends are intellectual and spiritual rather than technical. A student entering into the Christendom spirit will see his or her college years as an opportunity to develop the mind by a thorough study of the liberal arts, a study important to the ordering of his or her own life and to exalted human endeavor of every kind. The capability for logical thought and clear, effective, and persuasive expression developed at Christendom College is a great help toward success in any profession. A liberally educated graduate has far greater potential for professional advancement than one who is merely trained. In keeping with our goal of graduating students prepared to help reshape the temporal order, the College provides special orientation to the influential careers of law, politics, and teaching. The entire liberal arts program of the College, emphasizing truth, logical thought, and effective expression, is a superb preparation for law school. Regardless of major, a pre-law student is advised to select a minimum of two courses from among those in the Political Science curriculum which deal specifically with the law (e.g., PSAE 311-312 American Government and Politics, 333-334 American Constitutional Law, 499 Jurisprudence and the Catholic Lawyer). Pre-law students will find that any major offered at Christendom will provide excellent preparation for law school. An authentically Catholic approach to the study and practice of politics is precisely what is needed for the renovation of the social order. Young Catholics interested in pursuing a career in politics must be properly formed and trained to fill this need, and this is precisely what the Politics Program is intended to accomplish. For students not majoring in Political Science and Economics, two special courses for the Program (PSAE 382 Practica and PSAE 521 Internship) are designed to convey a basic familiarity with the opportunities, problems, and techniques of a career in politics. Interested students should see the Political Science and Economics section of this website for details and requirements. Christendom College recognizes the need for excellent Catholic teachers in diocesan Catholic schools, parish religious education programs, and public and private schools. Christendom College’s liberal arts majors, in conjunction with its superior core curriculum, provide an excellent foundation for a career in primary or secondary teaching. With a B.A. from Christendom College, an additional program of usually no more than two years will be necessary for teacher certification and a Master of Education (M.Ed.) or Master of Arts in Teaching (M.A.T.) degree. Furthermore, Christendom College’s core curriculum with certain additional courses in political science, American history, mathematics, and science meets or exceeds the “general studies” component for most teacher certification programs, except in health and physical education. Students should investigate the specific requirements for teaching in their subject and geographic location of interest, and the career development office will help them to do so. Christendom College does not offer teacher certification but does offer a pre-certification program which provides its undergraduate students the opportunity to explore a career in education and to develop teaching skills through the Teaching Apprentice Practicum. See the Teacher Formation Program section of this website for details and requirements. The Career Development Office highly recommends that students interested in the teaching profession enroll in Christendom’s Teacher Apprentice Program and take six credits of student teaching. These six credits are very helpful for students seeking certification to teach in the Catholic Diocese of Arlington and elsewhere.